Welcome to another pre-launch update for Conquest of the Gods. 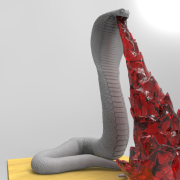 After some model previews its time for a final peek at the artwork. 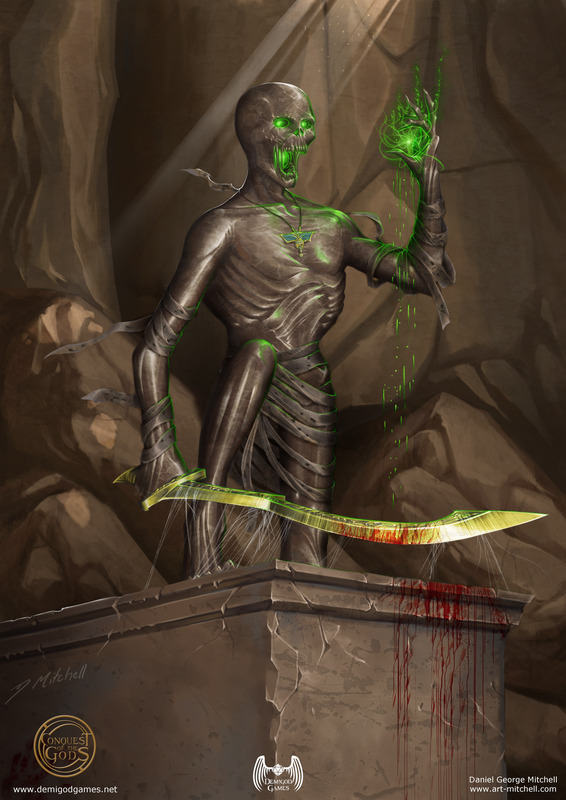 Today’s update features some artwork by Anikó Hollósi and George Evangelista as well as another piece from Daniel Mitchell. 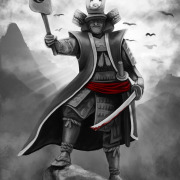 Like the other art styles, the Japanese art helps them stand out in the book with their own identity. 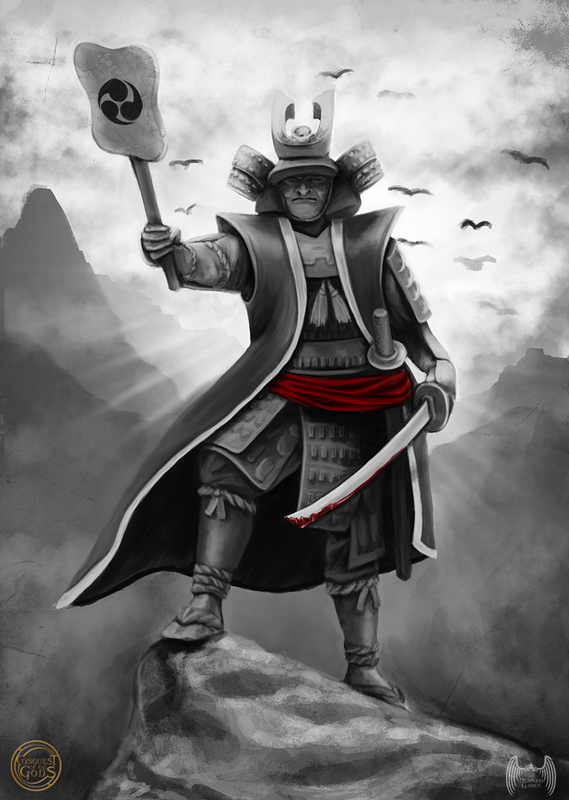 For the Japanese we have gone with a black and white art style that incorporates a splash of red. The original inspiration for this was from a Japanese tattoo of an Oni I found early on in doing research for the Oni – the tattoo was in black and white with the only colour being the demons red eyes… as you will see below, we have taken the same approach with our Oni’s artwork. Anikó it working on the bulk of the Japanese pieces, with George doing one or two of the monsters. Each unit in the book will receive the full page artwork treatment, and our creative team are busy working away on the rest of the images. 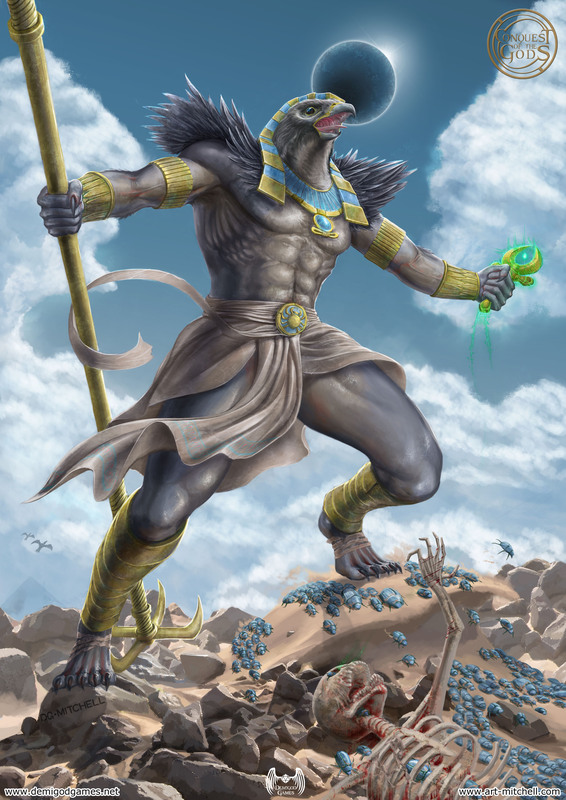 As an added treat, here is a recently finished Egyptian piece by Daniel Mitchell – behold Horus. 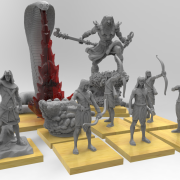 As a side, I will also be posting pictures of all of the prototypes/3D prints and where suitable, production casts of the starter set models to compliment the renders that are being shown off. It helps backers be aware that the models do actually exist in the real world. In the lead up to the Kickstarter i have had a few requests for more images of the various starter sets, last time out i showed you the Egyptian one, this time is the mighty Japanese armies turn. So here it is, behold the (planned) Conquest of the Gods starter set for the Japanese army. 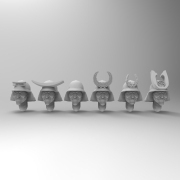 I am currently planning for this set to include 10 samurai (metal), 1 Daimyo (metal), 1 Hachiman, Japanese god of war (metal and resin) and one Oni (mostly resin with a few metal parts). As with all of the models in the range, the plan is to include timber bases. I also plan to include all of the model cards as well as a free mini rule book that covers the games core rules with each set. 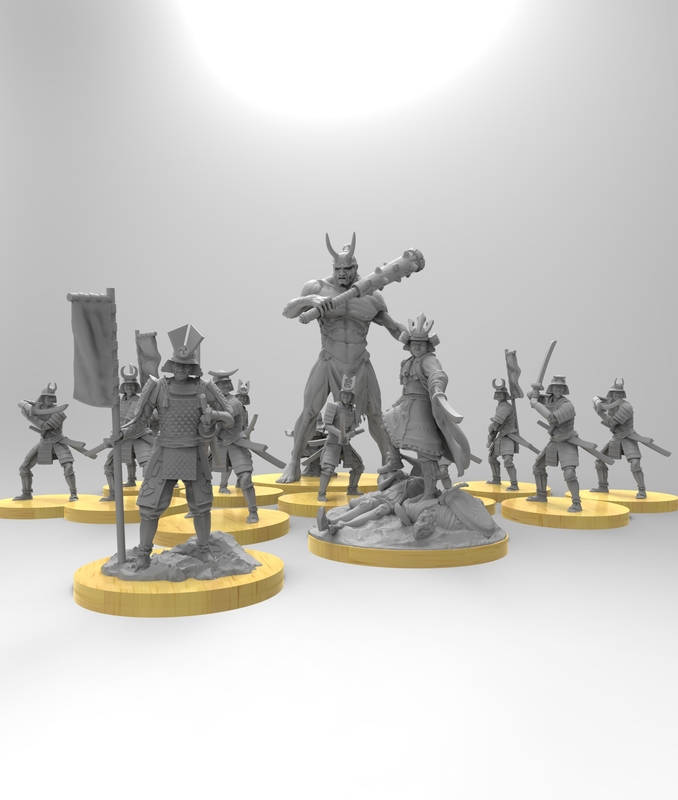 I thought i would also share some added details on the samurai minatures as well. With these the heads, arms and bodies are interchange, with 6 head options, 5 different bodies and 5 different arm styles, you can mix and match them to come up with a few variations. If things go well with the Kickstarter, i hope to also release more head variants. The 5 poses we have taken from actual kata of ‘form’ stances – so any of you who have studied Japanese martial arts (notably Akido or Ninjutsu) would be familiar with the poses. Again, with these i would love to do more of the popper fighting stances. 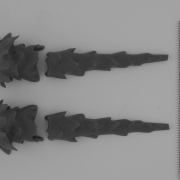 Below are some of the head variants on offer, with these we have taken some references from several museum pieces – some of the details have had to be exaggerated for scales sake but i think they are fairly honest representations. All of these models are now at moulding, so i will do an update and show off the production casts as soon as the arrive at my desk. 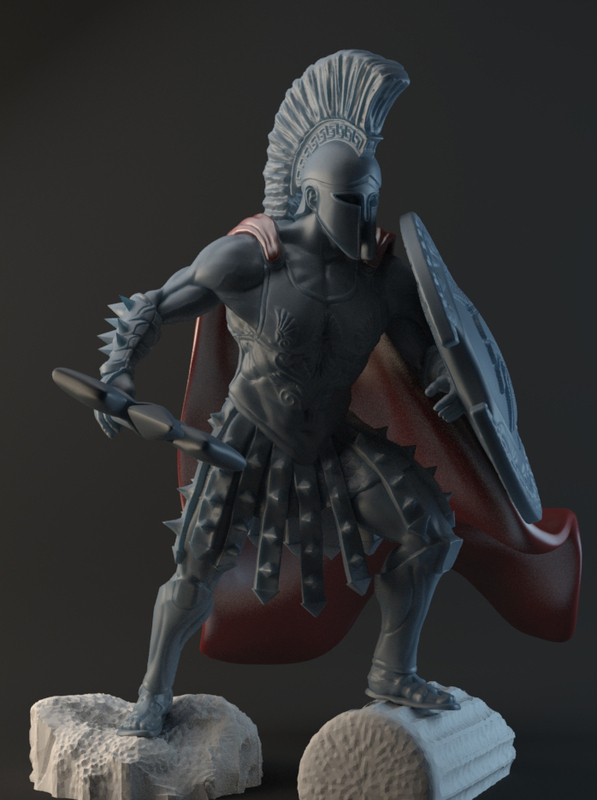 Im glad to report that using my 3D process there has been no loss from render to 3D print, and im yet to see any loss from 3D print to production cast! so what you see is what you should receive. 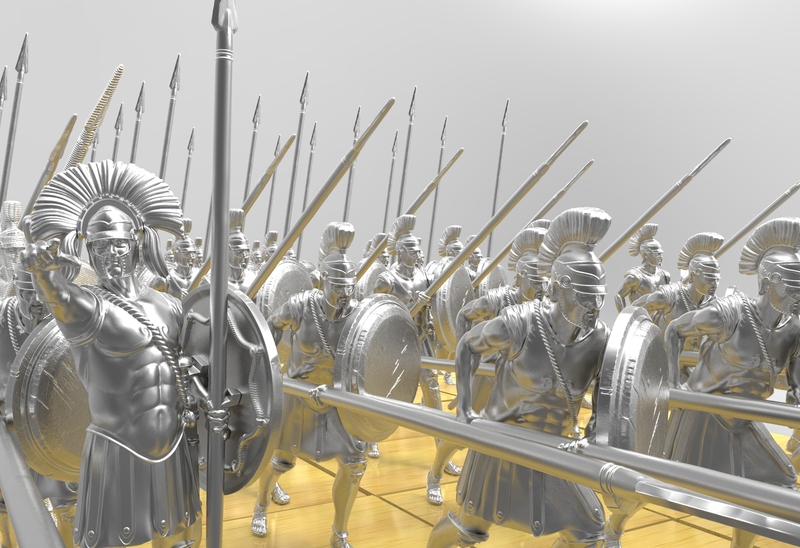 Stay tuned, next up will be a render of the Greek starter set. 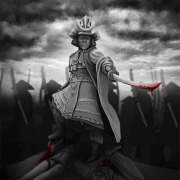 Then following that we may even have some painted Norse and some Japanese art work to show off. 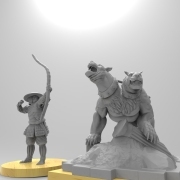 The last of the starter set models for the 4 armies were prototyped this week and I am very excited to share the prototypes with you. 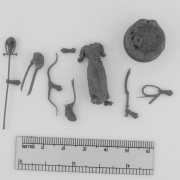 Below you can see Horus (base not pictured), The Uraeus, Egyptian Archers and the Greatest of 50 prototypes. 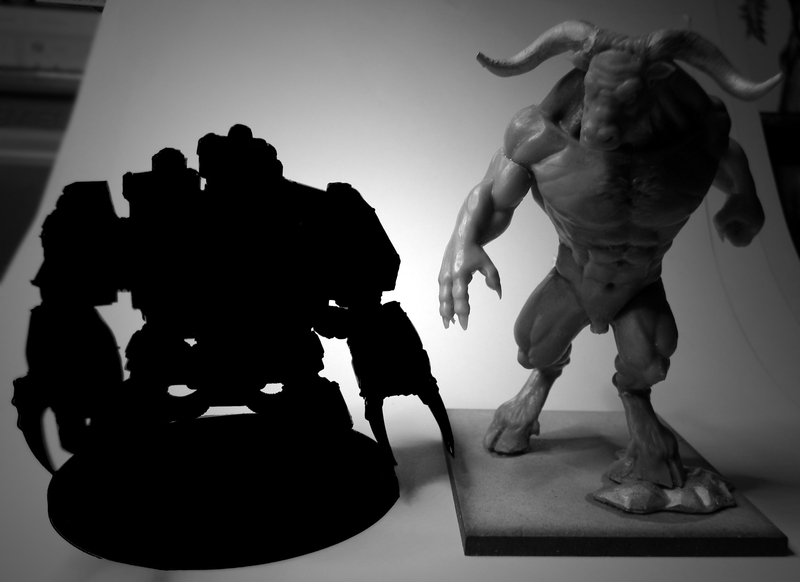 Horus is a pretty large miniature, once he is on his base he will be nearly as tall as the imposing minotaur and troll sculpts. His ‘scale’ is 51mm, however the base significantly adds to his height. There is also a small swarm of Scarabs in the image, ill reveal more on those later. Like Horus, the Greatest of 50 and Pharaoh have already had their renders shown off, so here are the models in their parts. 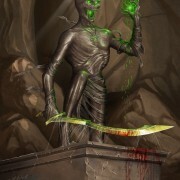 You will notice that the Pharaoh comes with two head options and both the Pharaoh and Greatest of 50 have weapon options. 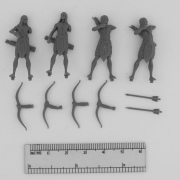 The archers are your basic Egyptian infantry. They are a cheap ranged unit that you will need to keep out of close combat. Finally the Uraeus. 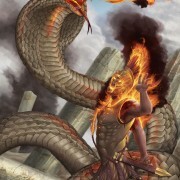 This is the large fire breathing cobra we previewed the art work for a few months back. 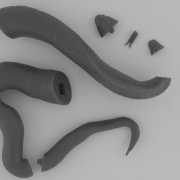 The Uraeus will come with an optional fire part that can be assembled and glued into the mouth of the model. This is just an added value part that I felt help sells what the model ‘does’ in the game. I hope to cast these in a red opaque or transparent resin. 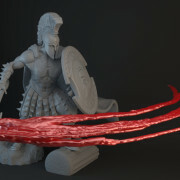 Once I have this confirmed I will let you all know how the fire parts will arrive – worst case scenario they will be cast in the regular resin I use but just tinted red. 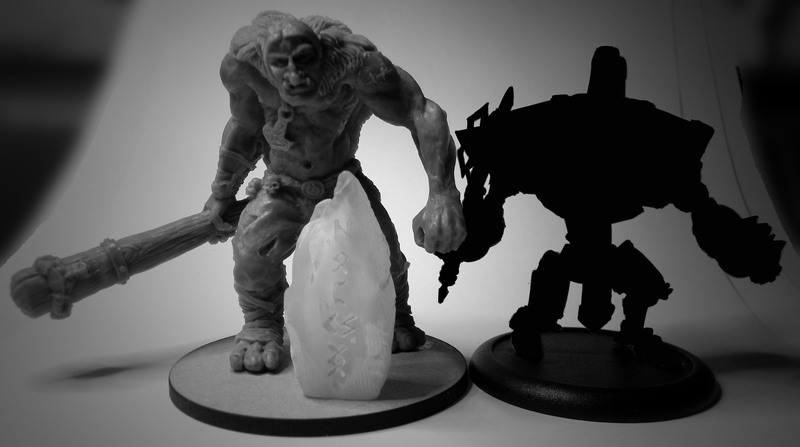 This milestone means that the models for all 4 starter sets are prototyped. It is now a matter of moulding and casting the last of these, though I am anticipating Horus to be an interesting challenge for my casters. 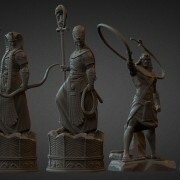 These Egyptian models are all going to moulding over the next 2 to 4 weeks. 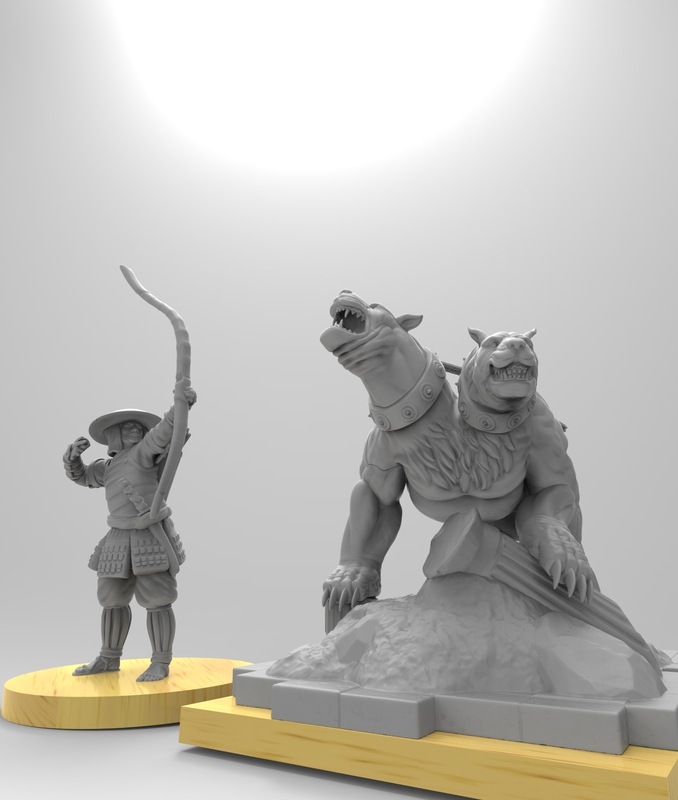 The resin parts might not quite make it back in time for the Kickstarter so these bad boys will probably be shown off as renders at the launch of the campaign, their images will hopefully be updated at some point during the campaign with their cast and painted incarnations. The part count may change slightly as I am thinking about reducing the part count for Horus’s weapon by welding some of the parts together before they are moulded. 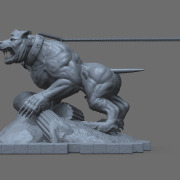 I am also yet to confirm what parts will be in resin and what will be in metal for Horus and the greatest of 50’s whip (that will probably be in resin). As mentioned above, the Kickstarter is nearing; we have a tentative launch date of November 17. This will be confirmed once I know that my advertising partner is good to go for that date, and I will make a more formal announcement. If things change I’ll probably survey everyone as to when they would like to see the Kickstarter live and aim for a close date that works for everyone. 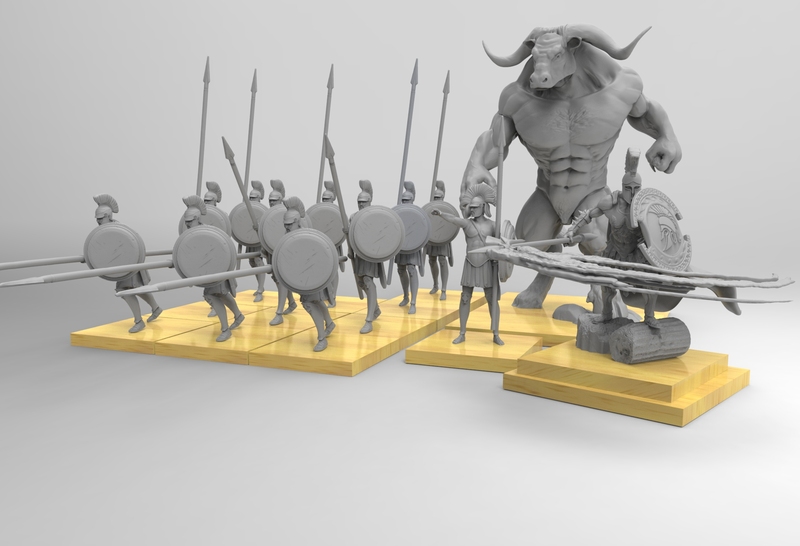 Damien Lam, one of our talented Australian 3D artists has been busy working away on the last of the Egyptian command models to feature in the launch range for Conquest of the Gods. The mighty Pharaoh and the greatest of 50 are the two key human command models Egyptian players may want to field as part of their army. 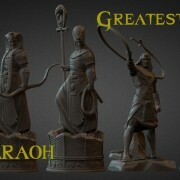 The greatest of 50 is planned to be released at launch in the starter set and if we manage to exceed our Kickstarter funding goal, then there is a good chance that the Pharaoh will be added into the Egyptian starter set. 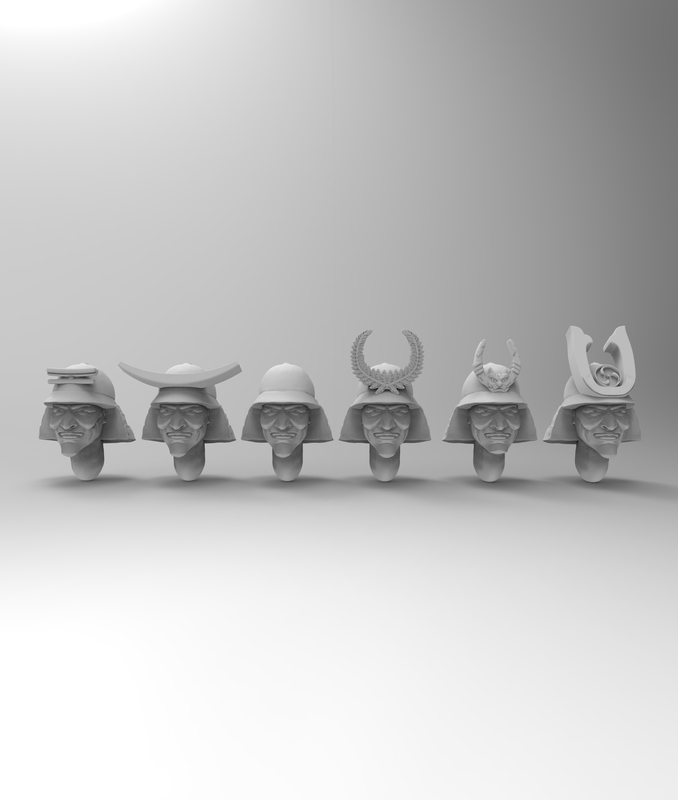 The Pharaoh will be released with two head options, a new kingdom style crown and a cobra style head dress. 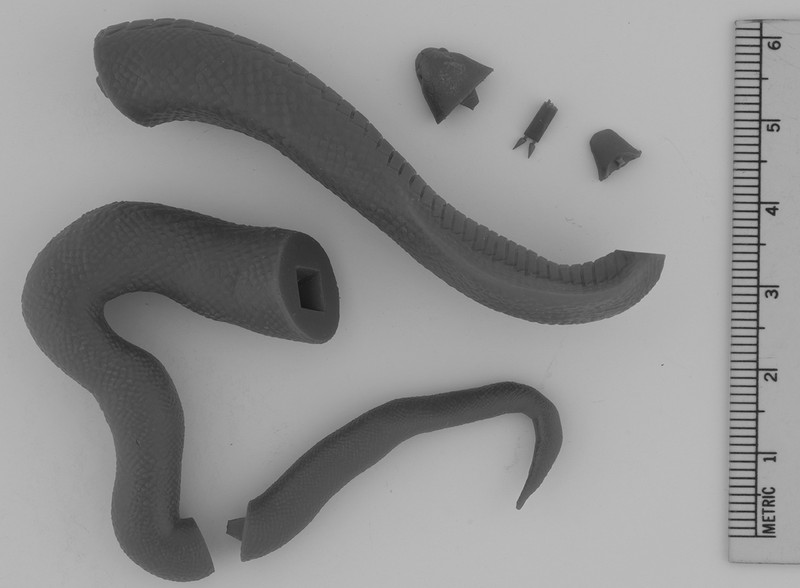 As these will be cast in metal, you may want to bend the tail of the cobra head dress to further customise your models pose. Both models will be released with several weapon options, some (but not all) of them are shown here. 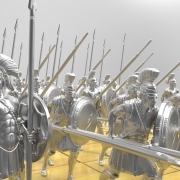 In Conquest of the Gods, you can customise your command models, each army differs in how the command models are customised, for example Greek commanders can be equipped with additional orders to issue to their troops. For the Egyptians, this customisation is done through weapon options; we will include the options with the model. 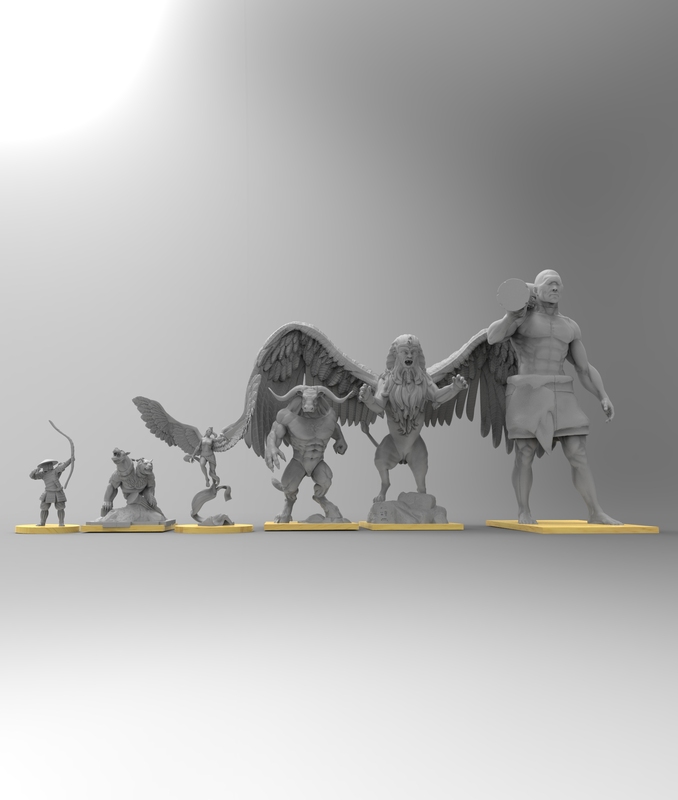 There are a few other interesting options for these models that i hope to show off during the Kickstarter campaign. 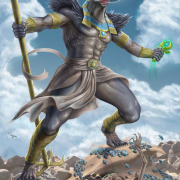 We are yet to show off the basic Egyptian troops and their starter set monster (though their artwork has been previewed). 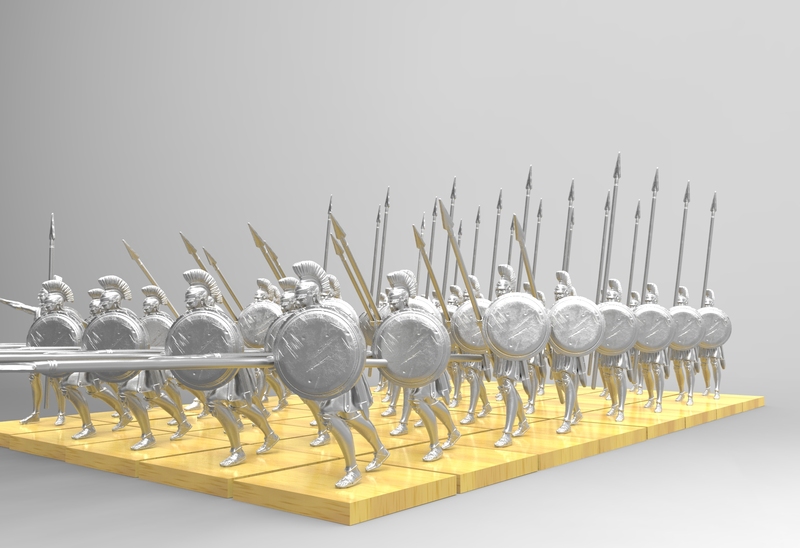 These are sculpted and are going through prototyping over the next two weeks, so we may opt to just show off the actual models rather than 3D renders, I will probably do the same with the Greek hoplites as I would rather show them off in formation. 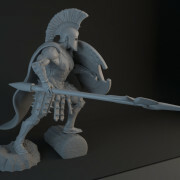 This update makes the final part of sculpting for the starter set models. 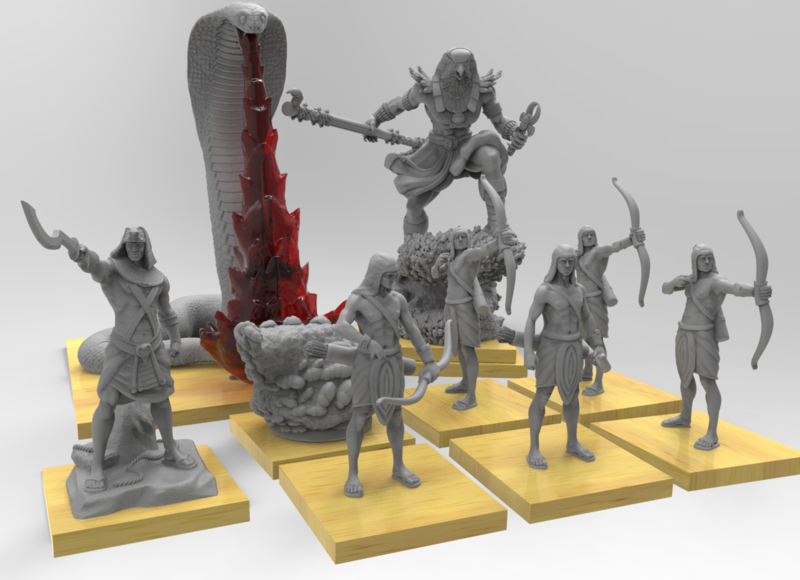 I can announce that many of the expansion goal miniatures are either under way or are sculpted and just need to be prototyped and to go through moulding (hence why we need to do a Kickstarter). 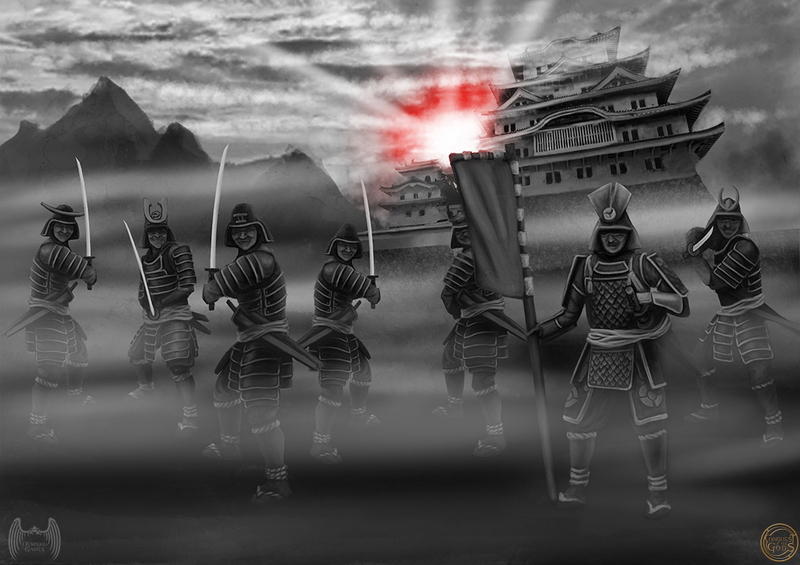 The book is coming along nicely and is going through some layout tweaks, we are still working on the Japanese artwork so the art preview for the Japanese section is still a little way off yet but will be live before the date of the Kickstarter is announced. 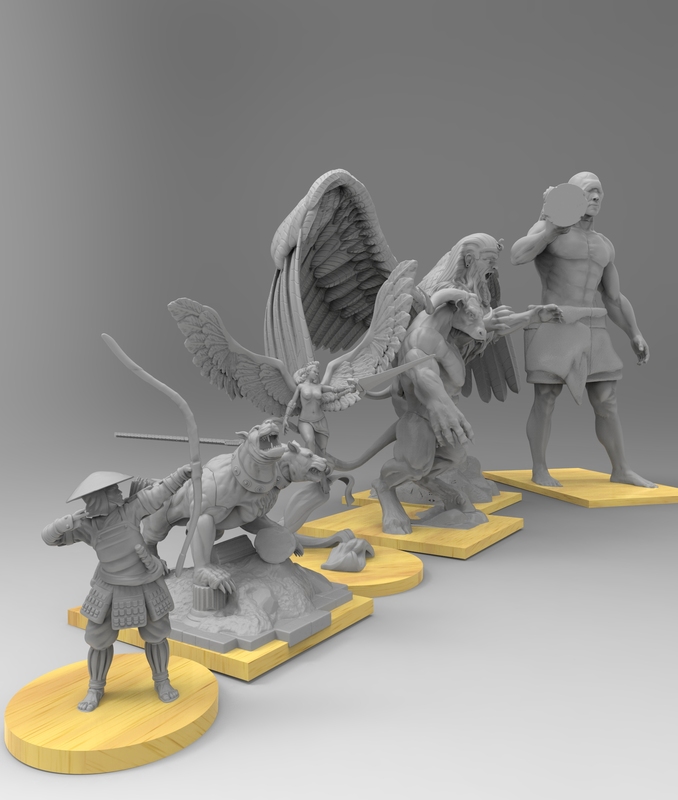 I need to get some laser cutting sorted, shipping quotes done and decide on how the models will be packaged –though the kickstarter models won’t be sent out in ‘retail’ packaging, to offset the lower prices. I dont think our Kickstarter backers will be really worried about the product pakaging given that Kickstarter is not for retail. Today’s update continues to preview content for our upcoming Conquest of the Gods tabletop game. 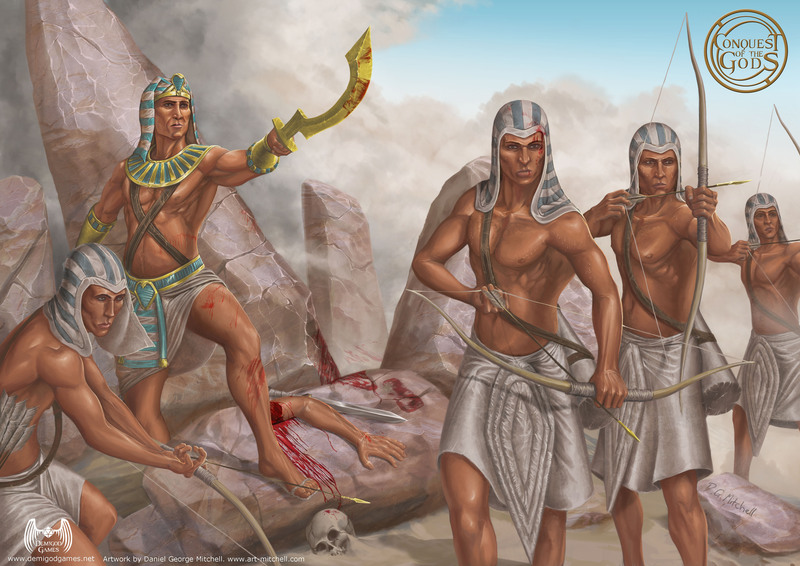 This update will cover the Egyptian artwork for the Conquest of the Gods core rule book as well as provide a small development update. 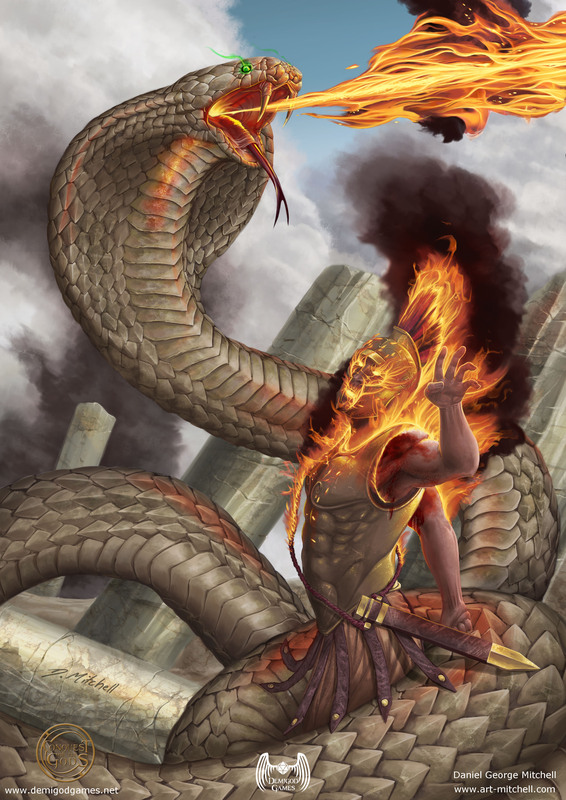 The Conquest of the Gods core rule book is looking fantastic, as the written content is now at the editing stage, only populating the books pages with fantastic art remains before I can have a test printing of the book done. 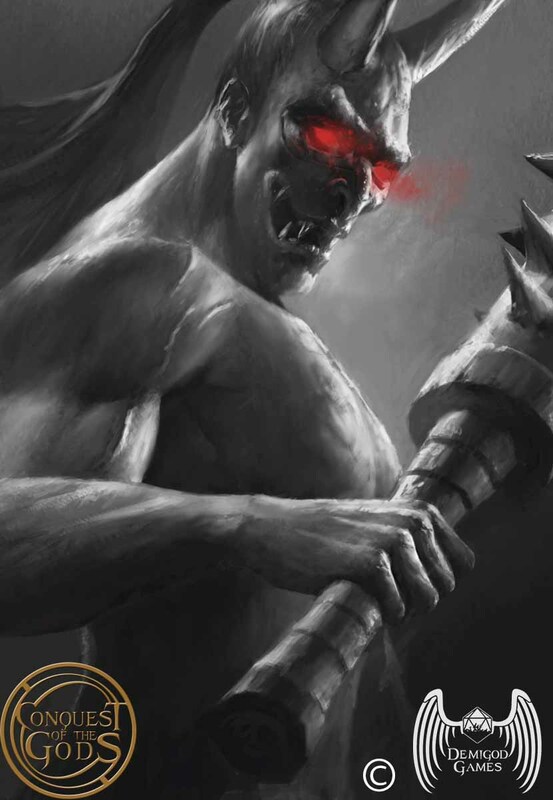 As covered in the Greek and Norse artwork previews each army in the book has a different art style. I am happy to formally announce a up and coming Australian artist Daniel Mitchell as the artist illustrating the Egyptian pages of the book. 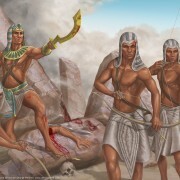 Daniels fantasy illustration style contrasts nicely with the other styles in the core book and his talents bring the Egyptian section of the conquest of the gods core rule book to life. 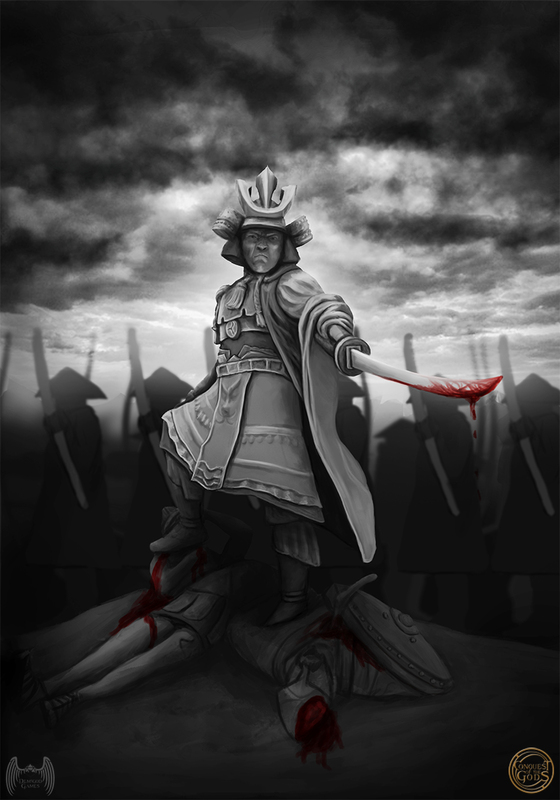 As a wargamer, Daniel also brings a players perspective to the art team. The most common question I am now asked is when is the game going live via crowd funding? I am currently aiming for a September/October launch window pending how the last few model prototypes and final production moulds go for the content that can be found in each armies starter set. 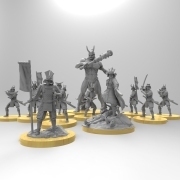 There have been a few delays in launching the game on Kickstarter purely due to my desire to have the main models for the campaign prototyped and production moulds for them done. This will prevent any nasty delays in fulfilling pledges, make the whole post Kickstarter process much smoother and helps ensure that my quality processes are in order. It also lets me weight the starter sets, plan and calculate postage properly, and lets me look at my fulfilment options and actual costs before the campaign ends.. This is pretty important as postage has been one of the down falls of similar projects. I can announce that Australian backers will receive free postage! I hope to bring you a Japanese artwork preview sometime soon. 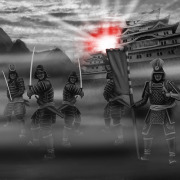 We are just nutting out the details on the Japanese section of the book, including the art. Those of you who follow our Facebook and Twitter may have noticed that this last week we showed a box of resin miniatures that arrived. 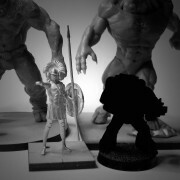 All of our mid-sized monsters that will feature in the starter sets will be resin/metal hybrid kits. 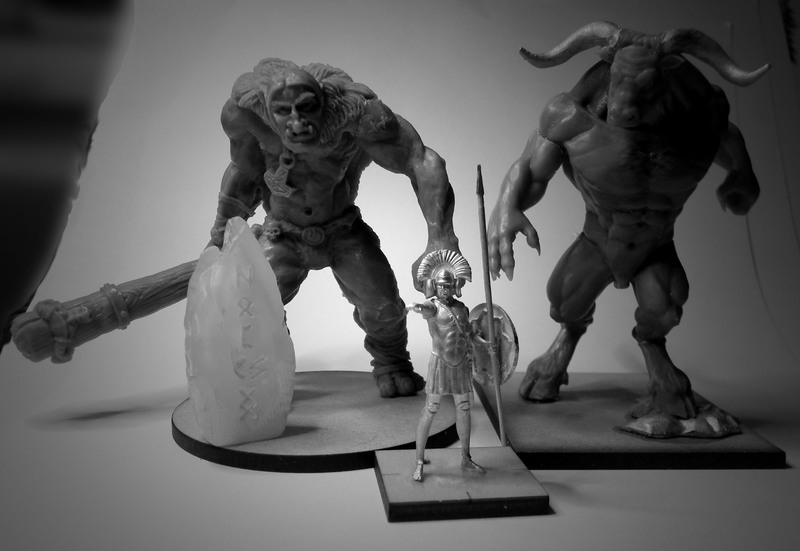 The final production resins for both the Troll and the Minotaur showed up and I have to say im very happy with the results. 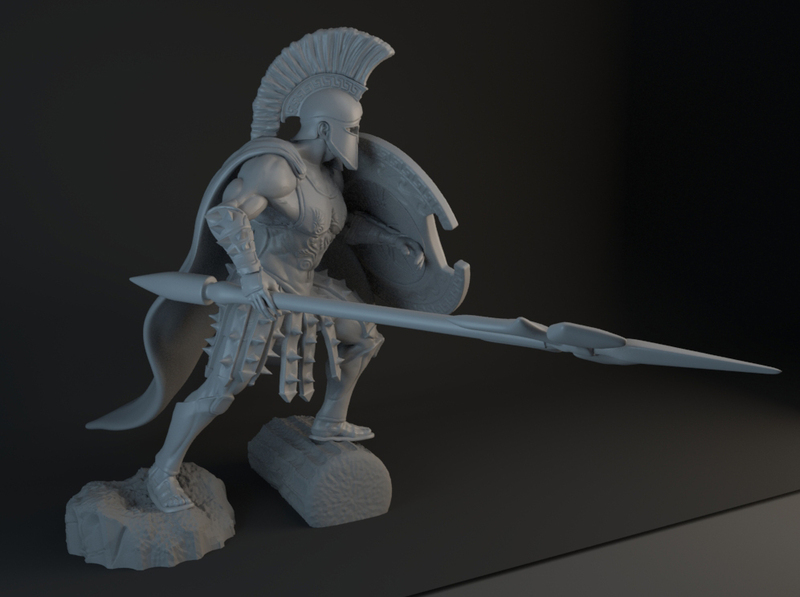 I also had cast copies of one of the Greek models that show up. 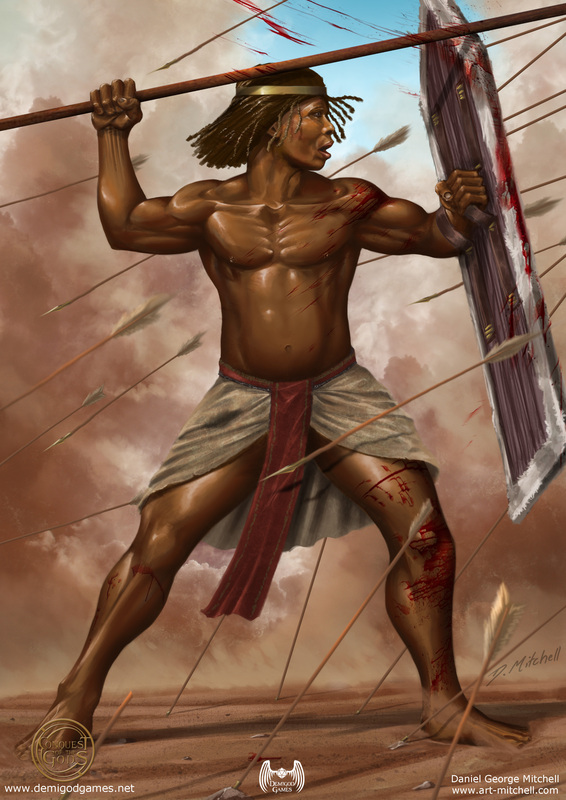 The Lochagos is your typical hoplite unit leader/command model. 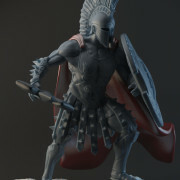 He gives you a general feel for the style of the Greek models and a feel for the human models in scale to the mid-sized monsters. 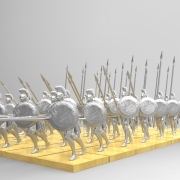 The hoplites and other Greek models are in our prototyping queue so I expect to have these in hand along with most of the other metal miniatures within the month. 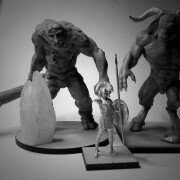 A couple of points on the miniatures pictured. 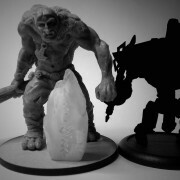 The bases are prototypes and the rock on the trolls base is just a 3D print, the final copy of it will be in metal. This rock can be either added to the trolls base so that the model matches the artwork or alternatively, mounted on a 30mm base and used as an objective marker. 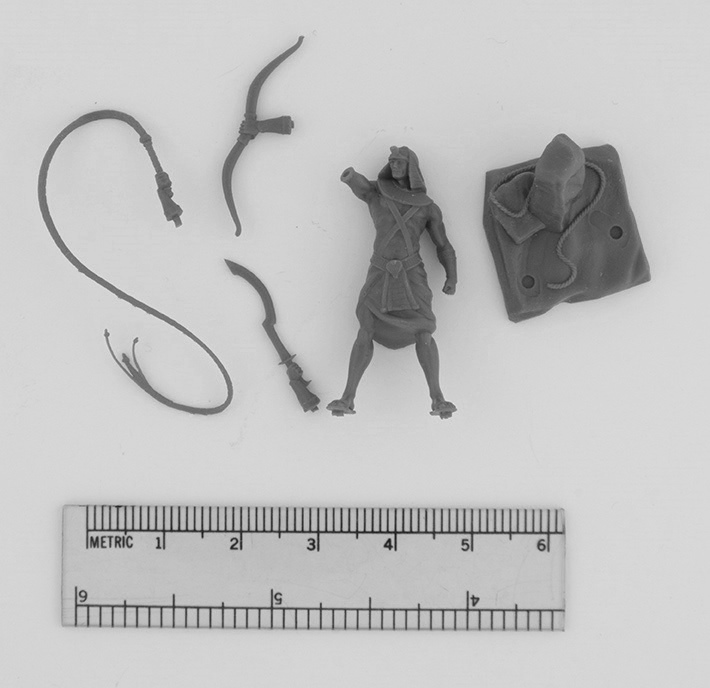 This marks an important milestone in the preparations to launch the game as I now have tested and proven production casts of the resin miniatures on hand (and a reasonable level of stock on hand in preparation for the Kickstarter). This means that after the game launches there won’t be any supply or casting issues as they have been ironed out. On the resin front I still plan to cast up the other two starter set monsters (and the base for Horus) over the next few weeks. 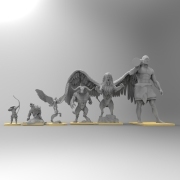 Once all of the starter set models are on hand then ill announce the date for the Kickstarter and the count down to the Kickstarter can begin. In showing these to my artists and others working closely on the project, a common question came up. ‘These look big, are they big or are the humans just a bit small?” … Well here are some scale pictures to show you the scale of the models in the range. For legal reasons I have silhouetted miniatures from other companies, though to most gamers it will be obvious as to what they are. 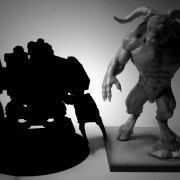 It is also time to give you some more details on what we are doing with the bases for our miniatures range. We have endeavoured to try and do something a little different; as such the process has taken a number of twists and turns as we went about bringing you a high quality product that looks good, functions well in game plat and feels like a premium product in the hand. Looking at miniature unboxing’s and assembly videos, we noticed that bases packed with miniatures are generally always an afterthought. Making a cheap black plastic base interesting has always been a challenge for hobbyists and has spawned some great basing products, but we really wanted to give you something that would look good without the need to spend more money on additional basing supplies. So to achieve this I decided to make the bases for the Conquest of the Gods range from high quality laser cut timbers. Using timber brings some new and interesting options. By using a grained timber hobbyists can opt to base their model on the wood itself and varnish or stain it to compliment the pallet they have chosen to paint their army. By looking at a variety of timber stains and varnishes, gamers can come up with some interesting variations to make their army look unique. Thinned downed paints and inks can also be painted over the wood grain to ‘tint’ the wood a certain colour. 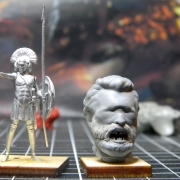 Gamers who have little or no time to paint miniatures may opt to base the model on the wood base and varnish the entire piece, making a nice looking piece that whilst isn’t as impressive as a completely painted miniature, it looks far better than an undercoated or plain plastic model on a plain plastic base. By using wood, we can also laser cut the movement trays at the same time. This means that with our range of miniatures, movement trays will be included with the larger units at no extra charge. All you will need to do is glue the movement tray components to a suitable material such as plastic card, cardboard. By using timber it also allows us to have a larger range of base sizes, and whilst we have stuck with the ‘typical’ sizes for the smaller models, we have been able to introduce a few new sizes better suited to some of our larger models. 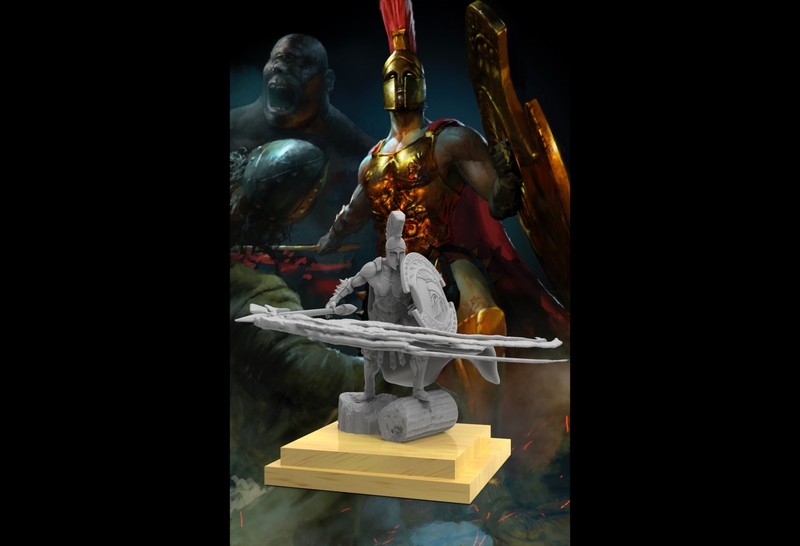 God models will also come with base toppers; these are designed to be an optional part to the base, turning their bases into a miniature plinth. This elevates the models up higher to make them stand out more on the table. The topper and base have a 2mm hole in the centre that can be aligned using a toothpick before they are glued together using your preferred glue of choice (we will be recommending PVA). 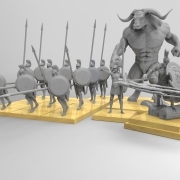 For those who hate plinths (we know there are some of you out there) they may opt to not use the topper, though we feel that the design does enhance the model and helps make the important models on the table more eye catching. If the concept proves popular we will look at doing some additional topper designs for each army as optional extras to give players even more variation. We will be experimenting with different timbers over the coming months and if the crowd funding campaign does well, we hope to offer each army different types of wood and grain to complement their range. Before the Kickstarter launches ill be doing a preview where the timber bases are painted, stained etc.. to show of the versatility of going down this path for the bases. I’ll also show off production casts of the other two starter set monsters and starter set miniatures once they are on hand. 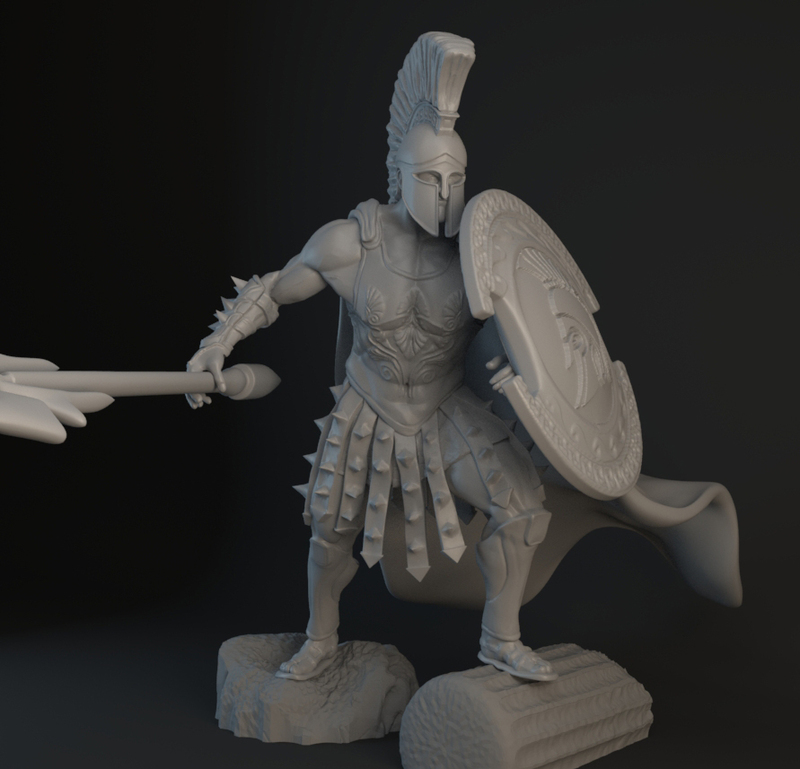 Today we preview the long awaited Greek god miniature: Ares. 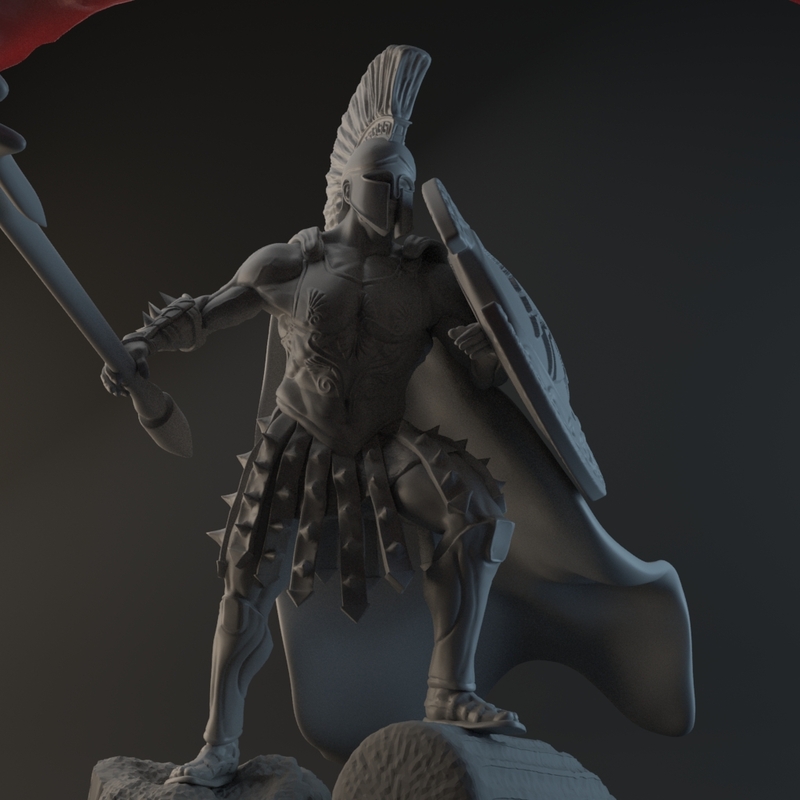 Ares is the final god miniature to be previewed for the Conquest of the Gods range and like the other three, will feature in his respective (Greek) starter set. 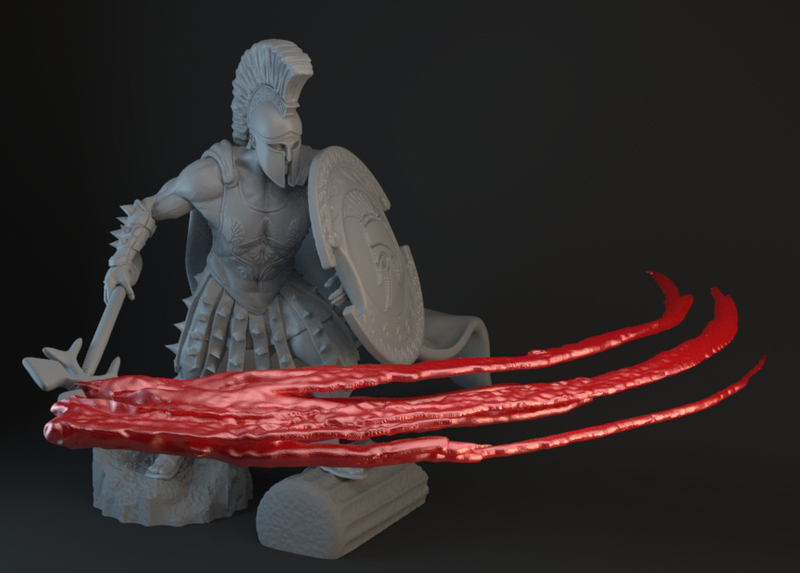 Sculpted by Sydney based artist Oliver Cook, this multi-part, multi-material miniature will be released inclusive of the scenic elements for his base (yes that includes the blood!) 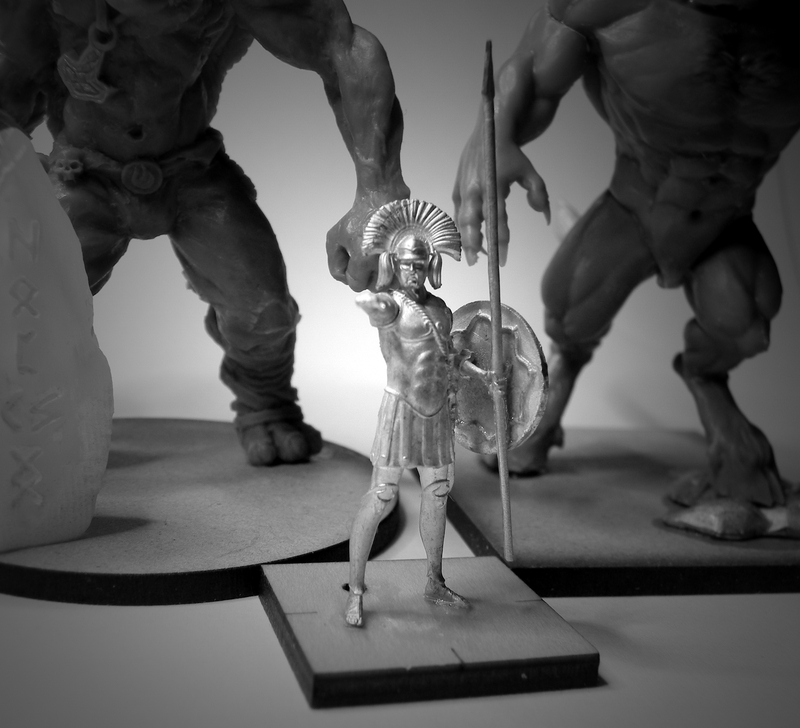 as part of the Greek starter set for our upcoming Kickstarter campaign. 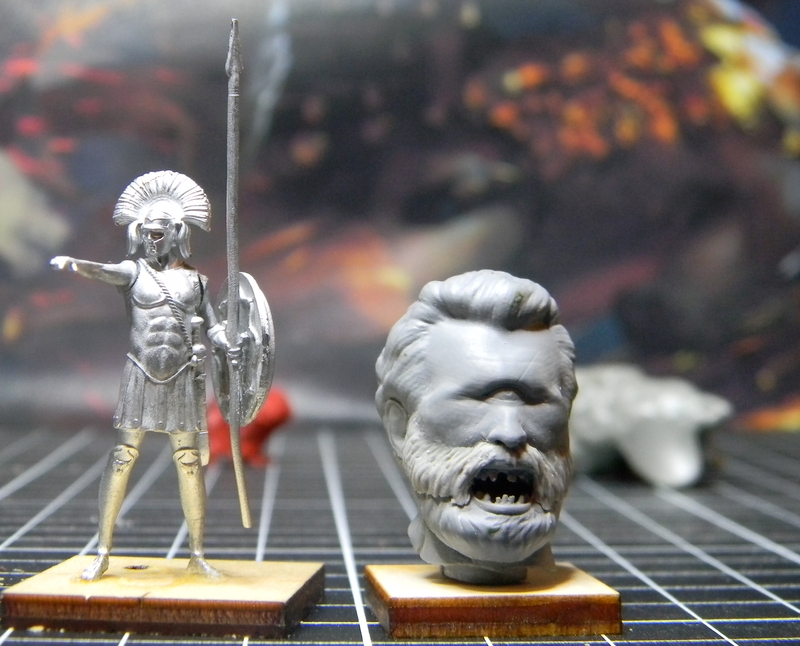 The 31mm scale (heroic 28mm) Ares miniature is donned with an ornate Corinth helm and heavily decorated cuirass suited to a god of Olympus. 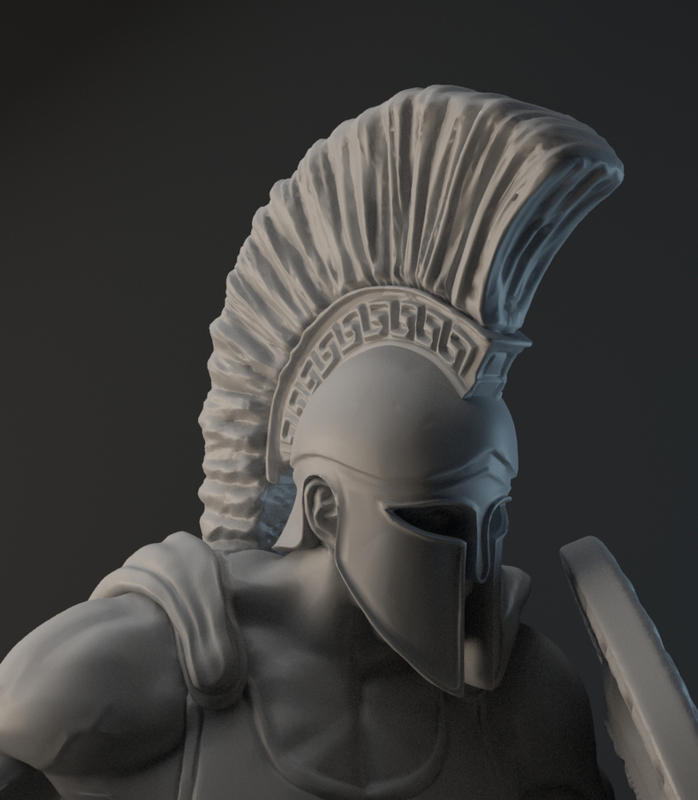 As one of the symbols of Ares is the spear we have armed him with a mythical looking ornate spear at fits within the design fitting in with the broader aesthetic style of a Greek god in our setting. 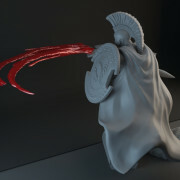 The 3D blood adds to the models presence and is reflective of the characters brutality in both the game and the fiction. 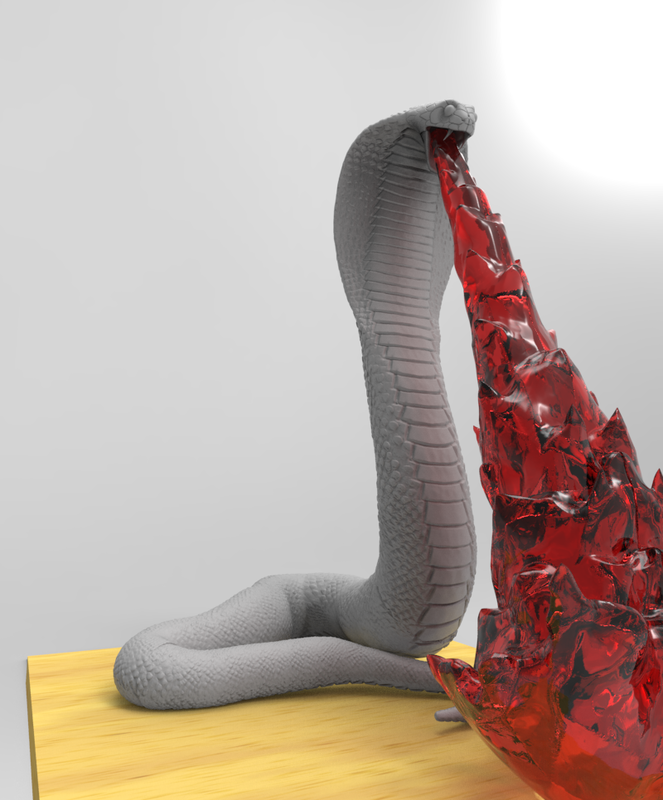 It has been coloured red in the render to help sell the idea. 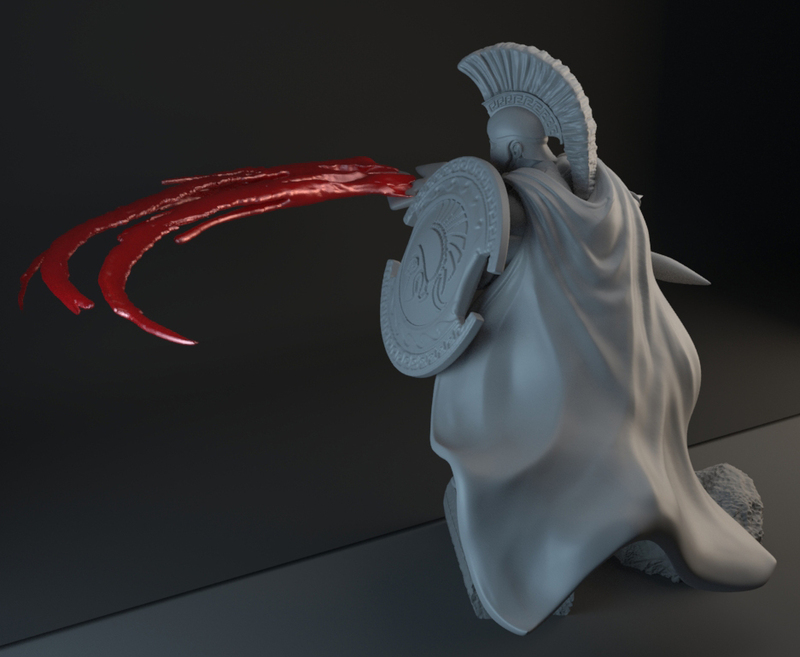 Both the blood and his cape are separate parts that you may opt to leave off the model when you assemble it. It has been a long journey to bring this preview to you, as there are a number of challenges in the design and concept that we needed to overcome. 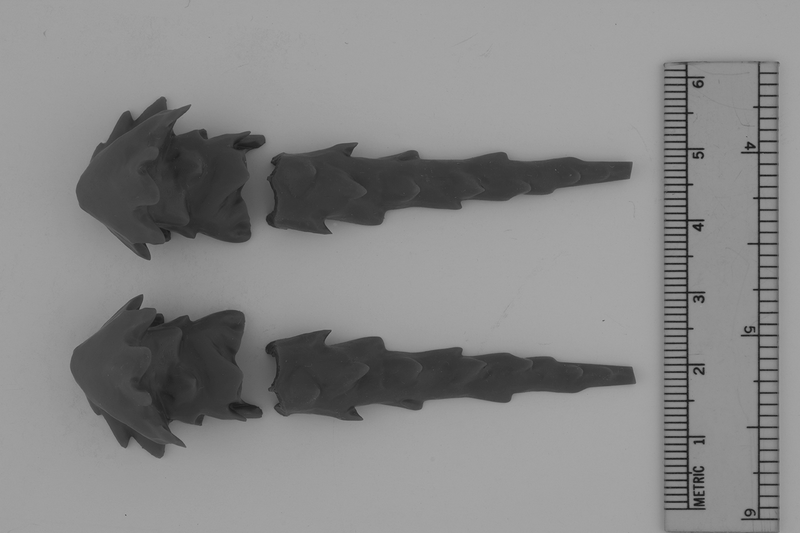 To bring this model to life we are needing to use two different 3D printing technologies as well as two different casting partners. 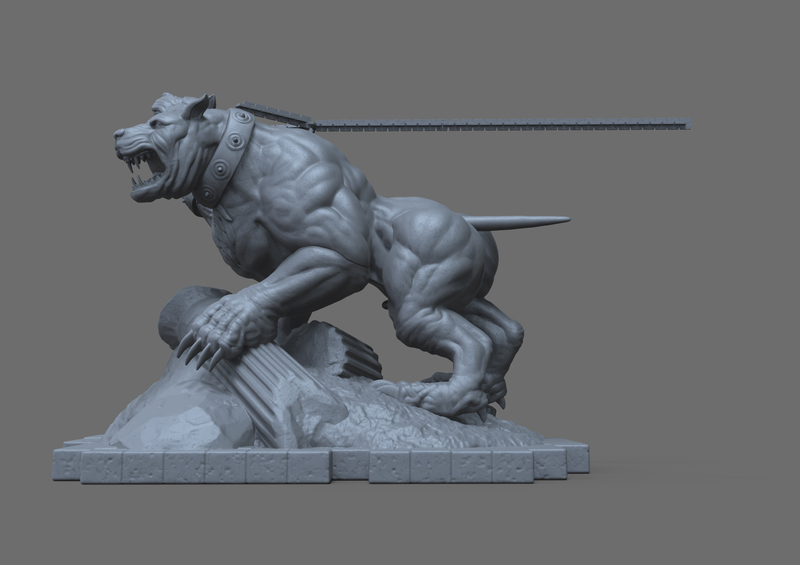 The wait for this one has been well worth it and we will be showing off final production casts of this model before we launch the Kickstarter. 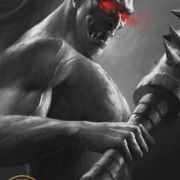 As Ares is one of the lesser known Greek Olympic gods, son of Zeus and Hera he represents the physical or violent and untamed aspect of war and has played a relatively limited role in Greek mythology as represented in literary narratives. 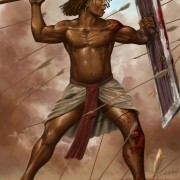 He was primarily worshipped by soldiers and the Spartans, and is considered by many historians to have been a niche god who was only worshipped when the need necessitated it. This is not the case in Conquest of the Gods, he is a central charter in the core rule book fiction. 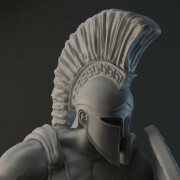 The preview of Ares marks an important milestone in the lead up to our launch. Production prototyping and moulding is well under way for all of the other previewed models (and quite a few we have not yet shown). A broader project update will be forthcoming with more details as to where we are up to and what you can expect from the crowd funding campaign. 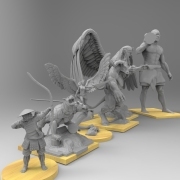 Once the production casts of this and several other key models are in hand, the game play video will be filmed, and again this will coincide with our Kickstarter. 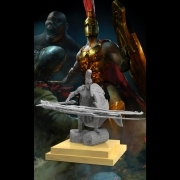 Stay tuned as we bring you more exciting news and developments on the Conquest of the Gods table top wargame.